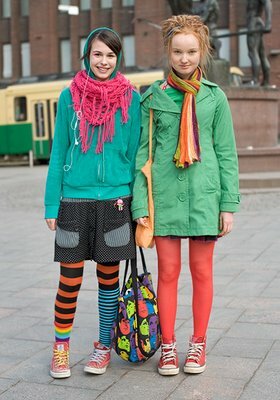 That means 'colourful' in Finnish. Sara and Helmi of Helsinki certainly know how to stand out- I'm loving Helmi's red tights. Posted by la femme at 2:23 a.m.
oh to be a skinny ingenue, and to be able to wear mismatched clothing and look charming! whoa! awesome! i love the girl with the mismatched leggings at the left! Oh, to be 18 again. Wow...and I thought Japanese ppl had the whole colour mis-matched thing down to a tee...... I love the way these girls have put together their outfits! they're adorable -- where do I adopt them?